Venezuelan representative in Geneva thanks 57 countries for their backing. 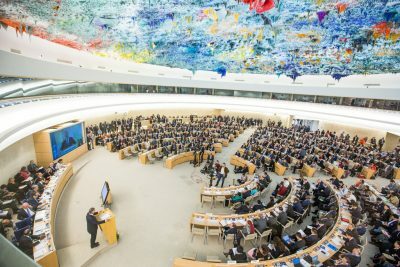 Representatives from Cuba and Nicaragua have expressed their support for the Venezuelan people and the government of Nicolás Maduro at the U.N. Human Rights Council in Geneva. As members of the Bolivarian Alliance for the Peoples of Our America, ALBA, both countries insisted that they will respect the sovereignty of Venezuela, and denounced constant attacks by the Secretary General of the Organization of States, OAS, Luis Almagro and the United States. The Venezuelan ambassador to the Council Jorge Valero reiterated his government’s call for peace and the protection of human rights. Valero said the support that Venezuela had provided to other countries for their development has today paid off, and added that the differences in Venezuela should be resolved at the ballot box. #Ahora ? Embajador de Venezuela #ONU, Jorge Valero: "Apoyo que ha brindado Venezuela a países para su desarrollo hoy se ha visto retribuido"
He thanked the 57 countries present who supported the declaration presented by Cuba and Nicaragua on behalf of the ALBA bloc. “This overwhelming support shows that the government of President Nicolas Maduro is backed by a majority of governments and peoples in the world”, he said.